Was What Happened in Tunisia a Twitter Revolution? As it did during the recent shootings in Arizona, the Twitter network provided a ringside seat for another major news event on Friday — the overthrow of a corrupt government in the African nation of Tunisia, after weeks of protests over repression and economic upheaval. And even as the country’s ruler was being hustled onto a plane, the debate began over whether Twitter had played even more of a role in the revolution than just reporting on it as it happened: was this the first real Twitter revolution? The correct answer is probably yes and no. Did it help protesters, and thus the end goal of overthrowing the government? Undoubtedly. Was it solely responsible for that happening? Hardly. Would this revolution have happened if there were no Facebook and Twitter? I think this is a key question to ask. If the answer is “yes,” then the contribution that the Internet has made was minor; there is no way around it. They called it the jasmine revolt, Sidi Bouzid revolt, Tunisian revolt… but there is only one name that does justice to what is happening in the homeland: Social media revolution. The role of social media in activism is something that has been debated a lot over the past year or so, in part because of a piece Malcolm Gladwell wrote poo-poohing the idea that tools like Twitter and Facebook could ever have much to do with real activism. Shirky responded to this argument — at least somewhat — in a piece he wrote on the topic for Foreign Affairs magazine recently, arguing that social media and other modern communication networks may not directly lead to revolution, but they sure help. So was what happened in Tunisia a Twitter revolution? Not any more than what happened in Poland in 1989 was a telephone revolution. But the reality of modern media is that Twitter and Facebook and other social-media tools can be incredibly useful for spreading the news about revolutions — because it gives everyone a voice, as founder Ev Williams has pointed out — and that can help them expand and ultimately achieve some kind of effect. Whether that means the world will see more revolutions, or simply revolutions that happen more quickly or are better reported, remains to be seen. This is just an example of the transparency available to anybody with access to the world via the internet. The days of propaganda by use of controlled media are quickly becoming a thing of the past. People have true access to current events on the ground instantly. This provides the general population with a pulse on the truth. No longer do we rely on what we are told by those who are able to twist truths to their benefit. Whatever one believes regarding the role of social technology in Tunisia, the fact is that the government in Egypt believes it can have a significant role. Hence the closing down of the internet connections to the rest of the world, as well as shutting down mobile communications within certain parts of the country. If social media is irrelevant, why bother doing that? Of course, social media is not the only thing that matters. But it matters. I think that the Internet and mobile technology just like the printing press and the telephone is a change in the conditions of communication and a change in the conditions of change. The fact that governments, communities of interest, and polycentric sites of power all vie to game the situation in their favor continues as it always has. But a change in the speed of communication, in the intensity/density of communication is not simply one of ‘more’, it is one where ‘more becomes different’. Communication is an intensive dimension (like temperature, pressure, density, etc) and that means it is subject to a phase transition type of change (water from 99 to 1 degree celsius doesn’t seem to change at all, but from 1 to -1 it becomes something completely different). Is the Internet an indication of a phase transition, is social media an indication of the transition in action? I think so. This change in the conditions of change is full of uncertainty and will likely be both positive and negative, but that we are moving to a different of order of collective awareness is a certainty. I have worked on political campaigns for opposition parties in repressive countries. I’ve made good use of some of the tools mentioned here to undermine status quo control over the spread of information and grassroots organizing. I agree with Clay – it’s hard to say that the technology is having no impact even though it’s easy to demonstrate that Twitter or FB were neither the catalyst for what happened in Tunisia nor were they even considered pivotal. First of all there is an entire ecosystem of technology that is relevant and while any single website may or may not be pivotal at any given moment, the entire gamut from mobile phones to facebook to youtube to wodpress provide a platform on which people are able to expand their means of self-expression, collaboration and information gathering. Of course the exact mix will depend on the country and the situation. Secondly, revolutions (or even more deliberate democratic transformations) are seldom driven soley by technology. Technology exists in the context of social, economic and political realities which opposition movements will seek to exploit. For example, when food and fuel prices spiked in 2008, people’s online activism was easier to translate into offline activity moreso than in 2009 when prices had come back to normal because people were already so pissed off. Also, word-of-mouth still plays a role in spreading information throughout rural areas and among people who may not have twitter accounts. As soon as i receive a piece of information I can text message it to 20 friends, who pass it along and so on and so forth. Not everyone in the chain needs to be wired. All of this speaks to what Clay mentioned in Foreign Affairs where he wrote about the environment that surrounds technology being more important than the technology iteself. For example I did not appreciate the value of even a little more freedom until I started operating in a country with no free press. Even a slight opening/opportunity to express one’s views meant a great deal to people who had endured a repressive system for so long. Once people in this particular country learned about blogger and wordpress, blogs flourished like dandelions in a field. Even editors of mainstream newspapers that were not allowed to write freeely during the day would make eloquent, anonymous posts at night under pseodonyms. Even though there were repressive laws in place that could easily lead to widespread crackdowns and detentions, many people still spoke out in their own names through social media precisely because that was their form of resistence. If there is a backlash – i.e. people who post anti-establishment messages on their facebook page are easily targeted/arrested – that same backlash would have occurred in the past through tapped phone lines or spies in publishing/printing house that printed dissident flyers or pamphets. Which is to say that the tools of emancipation have always been monitored by the powers that be. Just because regimes do everything in their power to subvert dissident movements does not in any way lessen the efforts of those movements to chip away at the regime’s hegemony and perceived invincibility. Over time this provides a psychological victory to the dissident – that his voice is not stifled and that he can claim at least some of his rights. Lastly – freedom is something that comes over the long haul. You need systematic reform of institutions of civil society to make sure freedom is rooted in authoritarian societies. This will take more than tweets and updates. It requires education and awareness, transparency, commitment to reform, rule of law and visionary leadership. To that extent, I wish the Western media would be in a position to better inform the public about the actual state of affairs of the opposition in Arab and Muslim countries instead of becoming too preoccupied with the technology. So much of the rhetoric about our understanding of the Arab world is obfuscated by anti-islam rhetoric that we know relatively little about what is actually going in internally in Tunisia, or Egypt/Algeria/Morocco/Jordan/Saudi for that matter. The media is content with creating a simplistic secular vs. religious contrast without helping people to understand whether opposition movements have articulated positions on issues like freedom, judicial independence, minority rights, economic policy, free media, etc. The beauty of the internet is really the power it gives to the everyday man and how it can be used to spread information and bypass censorship. Twitter is just another tool in the arsenal against fighting unjust regimes. So may we conclude that this was not a “Twitter revolution” but that social media definitely facilitates organized social movements that bring about protests and actions that have the power to upend the regimes that are controlling the populace? And if not, which networks were used to facilitate such a strong movement? In the rush to label what happened in Tunisia, or in Iran, as a Twitter Revolution, we tend to both over-estimate and underplay the role played by social media technologies. Social media technologies are tools – what matters is how these tools are used and appropriated by people. Mathew’s parallel to the telephone is a good one. In Tunisia, social media seems to have served as a catalyst, facilitating information flows in a country where the media is severely restricted. Having being a BBC correspondent in the country, I have experience of how the government tried to controlled and managed what its people knew. The impact of social media in Tunisia was its role in spreading news about the protests, both inside and outside of the country. It is too early to evaluate how much of a role social media played, but arguably the ability to find out about what was happening in different parts of the country served as a catalyst. I wrote a comment but not sure if it survived its journey in cyberspace. It is indeed important to distinguish the two perspectives. And I agree that Evgeny’s views on the role social media can play are much more nuanced than I think Gladwell’s are — or at least the case he made (or failed to make) in that New Yorker piece. I do think Clay Shirky’s correction is important as the Gladwell position on social media does indeed seem to be “bah humbug” (which I wrote about here: http://technosociology.org/?p=178) whereas Morozov has more specific points of a much different nature. And, everyone, I don’t see anyone saying that Twitter made the revolution. The debate is about the role of social media in an apparently successful uprising by the Tunisian people that came at great human cost. I don’t think there is any disagreement about that anymore than saying that pamphlets made the American revolution. They played a role, for sure, and that is what we are trying to understand better. The thought that Tunisians may have done this themselves, for their own politico-economic reasons, and used whatever tools came to hand is clearly not acceptable to the Geek Chatterati set. This statement implies that the only users of social media and are people outside the events taking place, and the only use of social media is indirect. Now, there is that happening, of course. But that is not all that is happening. For people within the event are using social media and using it directly. Just like the French used the printing press, and other revolutions tried to take over the radio stations, telegraph and television stations. The media – in this case, social media – is important, and it has more uses than that cynical statement implies. Of course they used whatever tools they had at hand — that’s part of the point of this post. Twitter can be a powerful tool, just like any other form of communication. It’s not the only tool, and maybe not even the most important, but it is one that people — in Tunisia or anywhere else — did not have in the past, and that has changed the game to some extent. Those arguing for a “Twitter” or “Social Media” revolution are ignoring not only the people, but that the primary sources note the heavy lifting was done by Al Jazeera (TV) and mobile phones, mainly due to their penetration of Tunisian users. The main Social Media networks used were more Facebook, YouTube and other picture sites, than Twitter. The Tunisia revolution was being reported in lots of different media but as yet I see no-one claiming a “mobile phone revolution” or a “TV Revolution” or even a “YouTube revolution”. I’d like to add a correction. Evgeny has pointed out to me in mail that I have wrongly lumped his views in with Malcolm Gladwell’s, which I’d like to retract. Malcolm seems to have taken a “Bah, humbug” approach to social media, stretching Tom Slee’s ‘slacktivism’ critique (Facebook shout-outs for overthrowing SLORC won’t free Burma) to encompass all uses of social media. Where I went wrong was in imputing Malcolm’s “social media is politically inert” view to Evgeny as well, when he believes something considerably more complex. This a subtler view than the one I hastily attributed to Evgeny. He and I still disagree, but our disagreement is only slightly affected by the Jasmine Revolution, as it is only a data point for the larger question of the net effect on all the world’s countries. Thanks for that clarification, Clay. There’s no question that governments can still censor, use surveillance and so on just as they have in the past — and China is a great example of that. But at the same time I think we are seeing evidence that social networks and similar technologies (and I would include text messaging) can have a positive effect on social activism despite the fact that those things continue to exist. They do not cause revolutions to happen, and they may not always succeed in helping revolutions to happen, but nevertheless they can be a powerful tool in doing so, given the right set of circumstances. FWIW, I’ve seen Berkeley campus police following the twitter feeds of student protest organizers *during* student protests (as in, I heard one cop asking another if so-and-so’s twitter feed had been updated in the last ten minutes; they were trying to anticipate what a massed group of students would do next). A slightly different context, but actually not all *that* different and, I think, illustrative of the limitations of twitter in this kind of context. That’s very interesting indeed, Aaron. That and the recent DoJ action in trying to compel Twitter to release records are a valuable warning, and tend to support what I think is Evgeny’s argument –i.e., that these tools can be used just as much for repressive purposes as they can for positive ones. Dear Kool-aid tech people: food prices soared (thanks to QE); the people revolted. I realise it is inconceivable but not everything is directly related to technology. News pictures on Aljazeera don’t give the impression of a high tech population. There are downsides to protests and electronic social media. It makes it easier for the authorities to identify individuals (Wikileaks) and there’s no strong middle standing between the little people and the state. Most people don’t trust social media in my view, especially not until it says how it plans to make money. I don’t think Twitter is where any thought process has happened in Tunisia. Twitter can make it harder to develop an argument because groups don’t seem very democratic to me(!) I don’t agree that it gives everyone a voice. It gives those that are like minded a platform. Matthew, you quote Zeynep asking “was the French Revolution a printing press revolution?” To which the answer is _of course_ the French Revolution was a press revolution; it was unimaginable without the press. So Tunisia was no more a media revolution than the French Revolution was, but no less either. And though Twitter has become the short-hand for the changed media environment in Tunisia, my vote goes to mobile phones and Al Jazeera as the monikers for the media that made the most difference. Weighting the variables, though, are details, in my view, compared to the much larger change in the conversation taking place. No one believes social media _causes_ otherwise complacent citizens to become angry enough to take to the streets. It’s a convenient straw man for the skeptics, because, as an obviously ridiculous narrative, it’s easy to refute. And the effect of a new medium on society is so full of feedback loops there is no way to prize apart those effects while they are happening, and prizing them apart afterwards takes decades and consumes academic careers. The argument about the effect of social media centers on something much less causal and much more contributory: the idea that social media helps angry people achieve shared awareness about how many other people are angry, and helps those people take action. AJ contributed more to the first half of that equation, mobile phones to the second, FB more the first, Twitter more the second, and so on. “Twitter Revolution” is a headline, a label that compresses and distorts wildly, but arguing over whether we should use or drop the phrase (I think its dreadful, and never use it) is a lot less important than the underlying clarity the events in Tunis provide: no one thinks social media is the source of the anger, some people think social media was one of the things that helped convert that anger to action (Allnutt, Zuckerman, me), some people think that social media has little or no effect (Morosov and Gladwell, most famously). And from my point of view, that latter belief has become harder to support. Thanks for the comment, Clay. I think you are right that we tend to focus too much on the tools — whether it’s the printing press or the telegraph or social media — rather than the outcome. Perhaps that is human nature in part (did people obsess over the different kinds of printing press the way people talk about Twitter clients I wonder?) and perhaps it is the fact that the feedback loops are so dense, as you point out, that it’s easier to focus on one thing. Consider the socio-economic conditions (smart-phone & Internet penetration)in Tunisia I doubt the reach of Twitter to masses. Twitterers were the observers. But wiki, and the net broadly has probably got the cia and fbi into info overload. They cant keep tabs on everyone so they didnt get to scotch this with a jail sentence/accident/plane crash/skirmish. They are overwhelmed,! Heck Mark, Google can keep tabs on everyone for them: All they need is a subpeona. I think twitter and social networking definitely had a hand in ‘greasing the wheel’. I expect to see more of the sort in places like Lebanon and the middle east. The tide has turned and censorship is a real stickler for those who have tasted truth. In Lebanon? Exactly which Lebanese dictator is ripe for overthrow? Greasing the wheel for a mass movement by the people. Not particularly a dictator overthrow but more of a facilitation of popular movements against ignorance and oppression. Whoever it may that is trying to control by promoting ignorance and misinformation. That would be a great revolution if Ben Ali had an account on Twitter. I don’t see any revolution on this, people just use what’s available to them. No? 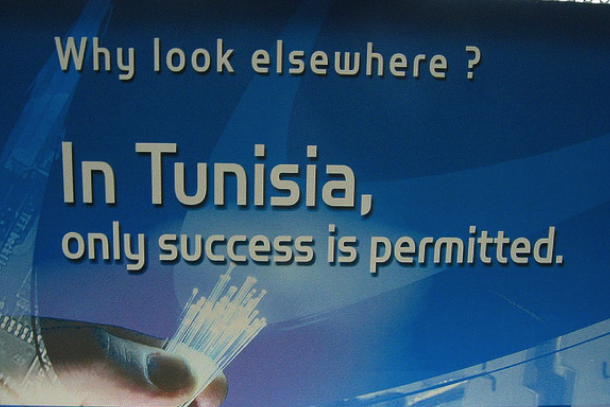 I believe the key question is whether Tunisians were consciously aware of Twitter. flow as they did from and about Haiti? If a significant number of people on the ground felt empowered by the assumption that they, others around them, and we in turn would have a full view of events, then yes, I believe we need to acknowledge a tremendous impact through social media (by which I mean Twitter). That’s IF they had any sense of connection. consider the hesitation of North Koreans. I think too much is being attributed to Twitter, yes Twitter helped get the word out and that’s how I knew what was happening in Sidibouzid about three days in, at that point very little was being written about it and until the last two days #sidibouzid never became a trending topic unlike the situation with Iran. And if it was such a Twitter revolution then why did the bulk of the mainstream Western press only start writing about it some 3 weeks later? Lastly there’s a lot of chaos and violence still going on in Tunis right now, masked militia men are looting property and police are beating innocent citizens. I don’t think we can speak of the ‘Tunisian Revolution’ as a revolution that ‘brought down the government’ because much of the old govt and the military are still in power and the ‘revolution’ is not even over yet. Is the media the principle fuel for revolution? Or will? I think will is the engine — social media can help provide the fuel (or the tires, or something). Of course twitter contributed to the expedition of the overthrow. But it was only one contributing factor. In the past the intelligence of the populace was restrained by a lack of current information which is usually controlled by those in power. This is just an example of the transparency available to anybody with access to the world via the internet. The days of propaganda by use of controlled media are quickly becoming a thing of the past. People have true access to current events on the ground instantly. This provides the general population with a pulse on the truth. No longer do we rely on what we are told by those who are able to twist truths to their benefit. This media revolution has reached worldwide proportions and now has the ability to change our world for the better. Twitter is only one avenue and is a true contributor to the break through against world wide ignorance. Wikileaks and Twitter only sparked what was a tinder-can of unrest. The economic situation (and lack of compassion/action to remedy) is what undid Mr. Ben Ali. Now the question remains, who’s filling the power vacuum? That’s a great point, Roofus — and a good question. I think a good question would have been whether or not this was a Wikileak revolution.